A survey by the American Bankers Association (ABA) revealed that the new mortgage rules (Dodd-Frank regulations) restrict the availability of credit, with 80% of banks saying there is less credit available and one-third only making qualified mortgage loans. The Real Estate Lending Survey also deported that one-third of bankers will only consider making non-qualified mortgage loans to targeted products or markets. In spite of these setbacks, there was some positive news from bankers. 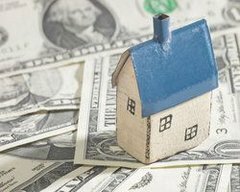 The 208 respondents, 76% of whom had assets of $1 billion or less, reported the greatest percentage of single family mortgage loans since the start of the mortgage crisis. The surveyed banks reported a decline in foreclosures to 0.73% in 2013 compared to 0.98% in 2012, while the average delinquency rate for single family homes fell to 1.87% from 2.40%. The “delinquency rate” is the number of loans for which borrowers fail to make loan repayments on time by total loans. Banks’ dominant loan is the 30-year fixed-rate mortgage, which increased to 50.3% of all lending in 2013, compared to 46.3% in 2012. Twenty-six percent of respondents reported greater commercial real estate loan demand; however, for 51% it remained flat. The delinquency rate in 2013 for commercial real estate loans stood at 3.3%, virtually the same as the previous year. 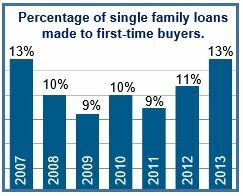 30-year fixed-rate mortgages accounted for 50.3% of all lending in 2013. Since the beginning of 2014, home-buying, construction and mortgage activity has been mixed. In February existing home sales sank to a 19-month low due to severe winter conditions and rising prices. Existing home sales fell in January too, while prices rose.